The results of a decade of research, primarily in Germany, Austria and Switzerland, contradict claims that air pollution was leading to widespread forest decline in central Europe. Dr Otto Kandler is emeritus professor and formerly held the chair in botany at the Institute of Botany, Ludwig-Maximilian University in Munich. Germany. · the most likely cause of Waldsterben was a complex ecosystemic disease triggered by cumulative stress from increasing air pollution, e.g. acid rain, sulphur dioxide, nitrogen oxide, ozone, hydrocarbons as well as soil deterioration caused by the deposition of pollutants. Many experienced forest scientists and foresters were sceptical about such claims; however, with few exceptions (e.g. Braun, 1981; Binns and Redfern, 1982) there was widespread acceptance of the Waldsterben scenarios, both in the scientific community and among the wider public. In fact, an extra cut of 10 million m³ Of timber in 1984 -equivalent to about 20 percent of the annual harvest in the former Federal Republic of Germany - was prognosticated by the German Board of Forest Economy in 1983 (Pfleiderer, 1984), and the Union of Forest Owners expected a loss of DM 1.3 billion per year for each 20 percent of Germany's forest area affected by Waldsterben (Meister, Schütze and Sperber, 1984). In view of the large public response to the frightening scenarios propagated by advocates of the Waldsterben theory, in 1982 the German forest authorities decided to carry out annual surveys to study the development of the neuartige Waldschäden (novel forest damage) - the official term now used instead of the popular slogan "Waldsterben" - and allocated substantial funding to support research into the cause of the allegedly new syndrome. In the annual surveys, conducted on a 4 x 4 km grid of plots, damage classes are defined by the percentage of foliage deficit with 0 = healthy (< 10 percent), 1 = slightly damaged (11 to 25 percent), 2 = moderately damaged (26 to 60 percent), 3 = severely damaged (61 to 99 percent), 4 = dead (100 percent). Discoloration can increase the damage class, depending on the percentage of affected foliage. The number of trees in the various damage classes is converted to the corresponding forest area (of the former Federal Republic of Germany) that they would cover if the damaged trees formed one stand. Thus, since 1984 the annual forest damage reports issued by the German Government give the percentage of the total forest area imaginarily covered by trees of each damage class. This classification has been adopted by other European countries and is the basis of a joint report by the UN Economic Commission for Europe and the Commission of the European Communities (ECE/CEC). Although this type of classification has no value in identifying the cause of forest decline, Manion (1987) emphasized the critical view of an analytical phytopathologist when he stated: "The fruit salad of deterioration, decline and dying trees should not all be squeezed into a generic 'fruit juice'", the series of surveys available since 1984 can help to determine the extent and dynamics of the alleged novel forest damage. The series of annual surveys from 1984 to 1992 in the former Federal Republic of Germany (compatible data from the former German Democratic Republic are not available) show neither the predicted steep rise in the degree of damage in the 1980s (Fig. 1) nor a progressive shift of the proportion among the damage classes from the lower- to the higher-damage classes and, finally, to death. In fact, there was no increase in mortality and no substantial extra cut was necessary. Consequently, the sustained fall in timber prices, predicted by economists in the early 1980s, did not occur and prices did not exceed the usual fluctuation (cf. Kandler, 1988a). The development of the annually recorded damage is different for each of the four main tree species (Fig. 2) as well as between various regions (Fig.3). The species evaluation shows that the slightly higher level of damage overall in the early 1990s, seen in Fig. 1, is exclusively due to the distinct increase in damage in the two hardwood species; both conifer species show slightly lower levels of damage in the early 1990s than in the early 1980s. In fact, the two hardwood species surpassed both coniferous species in 1987 and now exhibit much higher levels of damage than the conifers. Such an inversion of the proportion of damage in hardwoods and conifers is not compatible with the Waldsterben hypothesis which is based on an alleged accumulation of ecosystemic stress by air pollutants and their deposition, since trees show species specific sensitivities to environmental stress factors and responses should remain the same unless the intensity or kind of stress factors change significantly. It is noteworthy that Phytophthora cinnamomi has recently been isolated from the soils and roots of declining cork and stone oaks (Quercus suber; and Q. ilex) in Spain and Portugal (Brasier, 1992; Brasier, Robredo and Ferraz, in press). This fungus is an aggressive root pathogen which attacks a large variety of plant species. Since the deterioration of feeder roots, the main target of P. cinnamomi, has been reported to precede novel forest damage in oak and beech observed in central Europe (Vincent, 1989; 1991), Brasier, Robredo and Ferraz (in press) recommend investigation of the possibility of an involvement of P. cinnamomi in hardwood decline in central and eastern Europe. Large-scale typical smoke (SO2) damage of forests became common in industrialized areas of central Europe with the advent of industrialization in the nineteenth century. Such damage is still found today in the former eastern bloc countries, for instance in the Ohre Mountains on the border between eastern Germany and the Czech Republic. The two large lignite-mining areas developed in the early 1950s, Eger Valley and Bitterfeld, are the main sources of SO2, which has caused distinct forest damage over several thousand km² on both sides of the Ohre Mountains and has also affected the neighbouring Harz and Fichtel Mountains in western Germany (Wentzel, 1982). However, the actual death of conifers is restricted to the ridge of the Ohre Mountains at an elevation of c. 900 m above sea level where the damaging effect of SO2 is clearly enhanced by strong winds (Liebold, 1988). 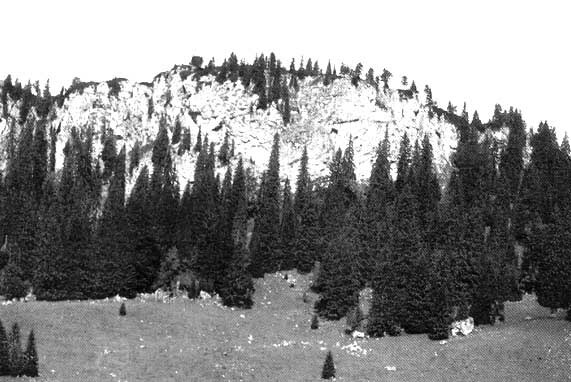 In spite of unequivocal identification as regular SO2 damage, photographs of the dying trees at the ridge of the Ohre Mountains are frequently shown as typical examples of Waldsterben in the media, thereby leading to confusion. In the former Federal Republic of Germany, the previously high SO2 concentrations in industrial areas and city centres had already been drastically reduced when Waldsterben scenarios were first described in the early 1980s, and they are continuing to decrease. A typical example of the reduction of SO2 concentrations in western Germany is the development of the SO2 concentrations in the Rhine-Ruhr area, the largest industrial conurbation in central Europe. At the turn of the century, conifer forests did die or were heavily damaged over an area of several thousand km² while the less sensitive hardwood forests survived, although with distinct growth reductions. However, after the 1960s the annual mean SO2 concentrations were reduced in three seeps (Fig. 4): first by technical improvements of power stations and smelters as well as by changes in the types of fuel used in the 1960s; then by the building of higher chimneys from the early 1970s; and, finally, by the desulphurization of funnel gases beginning in 1983. The level of 30 m g/m³ of the late 1980s compares with more than 200 m g/m³ in the 1960s (Bruckmann and Pfeffer, 1992). NO2 concentrations, however, decreased only slightly in the Rhine-Ruhr area at the end of the 1980s (Fig. 4) but remained at the same level in rural and forest areas in spite of the increasing proportion of cars equipped with catalytic converters (about 40 percent in 1991). There was also no change in the level of ozone concentrations throughout the 1980s. Figure 4 annual mean of SO2 and NO2 concentrations in the Rhine-Ruhr area and of SO2 concentrations in the Bavarian Forest (left scale). Source: UBA (1992), Bruckmann and Pfeffer (1992), BLEF (1992) and (1991). The ecological consequence of the reduction of SO2 concentrations in the Rhine-Ruhr area and other centres of SO2 emission since the 1960s was the prompt recovery of conifers and the re-immigration of spruce and lichens into areas where they had been absent for almost 100 years (Kandler, 1988b). These recovery phenomena demonstrate that SO2 only was responsible for the classical pollution damage; the contribution of the other pollutants was, at most, marginal. Neither the development nor the levels of novel forest damage in the total area of western Germany, in particular states or in single tree species, parallel the course of the actual records of SO2, NO2 and ozone concentrations at the country's permanent monitoring stations. Thus, it is unlikely that air pollution is a causal factor or even a significant contributing factor in the "novel forest damage" syndrome. This conclusion is corroborated by the measurements of gas exchange in attached branches of spruce trees in the Bavarian Forest (Koch and Lautenschläger, 1989; Koch, in press) and in the Alps (Häsler, 1991; Wieser, Weih and Havranek, 1991). The branches were enclosed in air-conditioned chambers for up to four years and kept in ambient or purified air. No difference in the rates of photosynthesis and respiration has been detected between the two chambers. These findings indicate that the prevailing concentrations of air pollutants in the chamber simulating ambient conditions were below the threshold of inhibition. The absence of a relationship between the development of the annually recorded forest damage and prevailing air pollution is further corroborated by a recent study on the spatial correlations between forest damage and air pollutants, based on the most detailed regional data basis available in western Germany (Neuland, Bömelberg and Tenhagen, 1990). The data covers damage classes 2 to 4 of all of the 7 016 single sites surveyed in 1985, together with tree age, soil and weather conditions and SO2 emission as well as SO4 and NO3 deposition at approximately 100 monitoring stations. As expected, a statistically significant positive correlation has been found between forest damage and parameters such as tree age, elevation of the site, flat and fast-draining soils and so forth, but no correlation has been shown between forest damage and air pollution (i.e. atmospheric SO2 and NO2 concentrations and SO4 and NO3 deposition). On the other hand, there was a correlation between soil acidity and forest damage: foliage deficit was lowest on acid podzolic soils and highest on well-buffered, neutral to basic calcium-rich rendzinas, Camibsols, etc. This finding is at odds with the acidification/Al³+ toxicity hypothesis (Ulrich, 1980; 1989). However, it is in agreement with the results of an experiment in which plots of an 80-year-old spruce stand on an acidic podzolic soil was either limed in the first year or treated with acid rain (pH 2.7) for six years (Kreutzer and Göttlein, 1991). After eight years, compared with the control plot the crown conditions (assessed by the same methods as those applied in the annual surveys) in the plot treated with acid rain had improved slightly while the limed plot had deteriorated slightly. Such findings call for a reconsideration and refinement of the supposed role of acidification in novel forest damage and show that the scenarios predicting a fast decline of forests because of actual deposition rates and demanding an immediate general liming of all forests showing novel forest damage (Ulrich, 1980; 1989) are pushed beyond the limits of available data. Tree ring analyses provide a reliable means for tracing the course of tree growth over long periods. Large-scale studies by many authors, covering trees from all the main species from different regions of central Europe, have revealed a deep inroad in the mid-1970s, which coincides with a series of drought years, but no general persistent decrease in diameter increment during recent decades. Trees of damage classes 1, 2 and 3 show different growth rates, but the deviation from the mean usually does not exceed the common range of variations which occur within large populations as a result of competition and different site conditions in the stand as well as individual mechanical damage, infestations and infectious diseases. 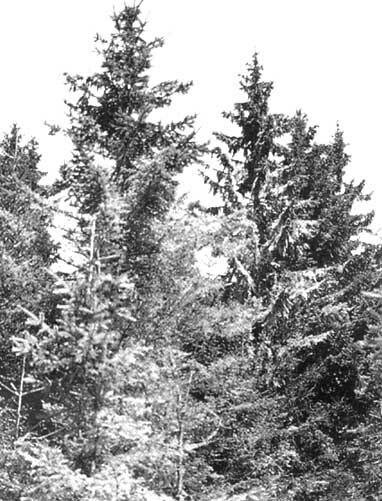 A typical example for Norway spruce is depicted in Figure 5. The tree ring chronology of 260 trees from the low mountain ranges to the south and east of the Rhine-Ruhr area exhibits the characteristics mentioned: a deep inroad in the mid-1970s, differentiation in ring width between the damage classes and slightly improved growth in recent decades, as indicated by a mean ring width of 103 and 110 percent in the periods 1963-1988 and 1983-1988, respectively. Note: Ring width is given as a percentage of a reference derived from previous growth. Percentage of trees in damage classes: 0=50%, 1=35%. 2/3=14%. Enhanced growth in recent decades is also seen when comparing increments in the diameter (cf. Fig. 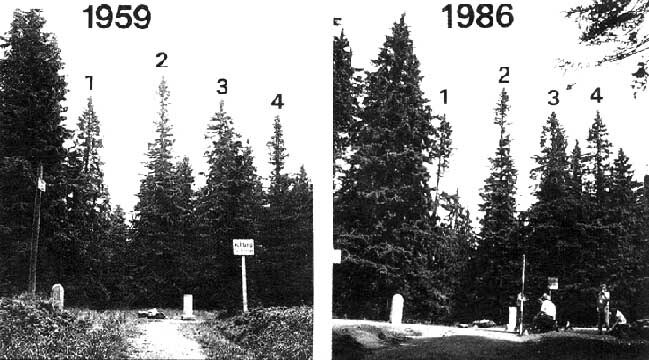 6 and Schneider, Lorenz and Poker, 1987) or height (Keller, 1992) of different generations of trees in spruce stands with identical site conditions: in spruce, 30- to 60-year-old stands grew faster than did 90- to 120 year-old stands at the same age. The final confirmation of substantially improved forest growth precisely during the period predicted to see the explosion of Waldsterben may be seen in the results of traditional forest inventories, based on periodically repeated volume evaluations in representative stands. Inventories undertaken in Germany and Austria in 1990 reveal that, in the government- and corporation-owned forests (roughly about 30 percent of the total forest area of the respective states), not only the annual increment but also the stumpage and prescribed annual cut have increased by several percentage points in all southern German states, while in Austria between 1975 and 1985, although the annual surveys for two of these states (Bavaria, Baden-Württemberg) showed the highest degrees of novel forest damage in western Germany (see Table). Referring to the improved growth, a forest administration official states (author's translation): "Site productivity in forests of Baden-Württemberg has improved. Stumpage, annual increment and annual cut in the government - and corporation-owned forests have increased by almost 20 percent in 20 years, and no end of this development can be foreseen" (Weidenbach, 1992). This statement emphasizes the need for a drastic change in perspective. Instead of asking "why are the forests dying? ", we now have to ask "why are the forests growing faster in the second half of this century than they did in the first?". Nitrogen input by the deposition of NOx and ammonia are frequently claimed to cause better growth, but they are said to cause the deterioration of the soils and death of forests in the long term (e.g. Nihlgard, 1985; Hofmann, Heinsdorf and Krauss, 1990). However, with the exception of studies in the close vicinity of stables for mass production of farm animals, few reliable data on the actual effects of nitrogen deposition in forests are available. An increase in the nitrogen content of spruce needles and in topsoil, a typical effect of nitrogen fertilization, was observed in pollution gradients close to agricultural point sources of ammonia (Hofmann, Heinsdorf and Krauss, 1990). Yet, no increase in the nitrogen content of needles and topsoils and no enhanced growth have been shown in the vicinity of point sources of NOx, such as power plants or large towns. Actually, in large forest areas of central Europe, where there are annual deposition rates of 10 to 20 kg of nitrogen per hectare, the nutritional status of conifer forests has been found to be still suboptimal (Zöttl, 1990). Thus, rigorous statistical studies on the spatial correlation of nitrogen deposition and enhanced growth are urgently needed. Temperature, precipitation (Fig. 7) and CO2 concentration probably contribute to the improved growth, since they act synergistically and their significant increase roughly coincides with the onset of improved forest growth in the middle of this century when nitrogen emission from vehicular traffic was still at a very low level. However, data on correlation supporting such suggestions are still missing. A third, often-neglected factor, viz. improved forest management (regular thinning, melioration before planting, pest management, etc. ), especially the discontinuation of litter and humus removal, may have been even more important. 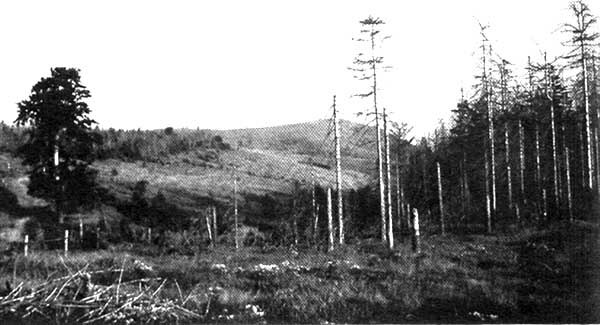 In 1920, the former head of the Bavarian forest administration, Rebel (1920), reported a 20 to 30 percent reduction of timber production in the Bavarian state forests as a result of litter raking. It is logical to assume that a significant increase in growth should have occurred after the poor practice of litter removal was discontinued in the 1930s to 1950s. In spite of generally improved growth, some stands still show poor growth and substantial tree death, but they are mainly restricted to orographically extreme sites with unfavourable climatic conditions, poor mineral supply, endemic diseases (e.g. root and heart rot), insufficient forest management or combinations of these factors. Note: Moving ten-year average. The mean values are attached to the last year of the respective ten-year period. 1 Source: Neumann and Pollanschütz (1991). ³ Data on annual harvest, increment and stumpage are given as a percentage of the respective data in the preceding forest inventory period. Inventories were carried out by the forest departments of the respective states/countries. 4 The Austrian classification is based on only four instead of five classes. Thus, the Austrian class 0 includes the German class 0 and most of the German class 1, while the Austrian class 1 comprises the remaining portion of the German class 1 and some of the German classes 2 to 4. The absence of evidence for the prognosticated rise in forest damage has evoked increasingly critical questions about the novelty of poor crown conditions which were claimed to be typical of Waldsterben. The necessity for a critical retrospective evaluation of crown conditions is clearly expressed in the comment: "Saying that the levels of defoliation are 'high', suggesting that the observed evolution is not normal, implies a reference to such 'norms'". 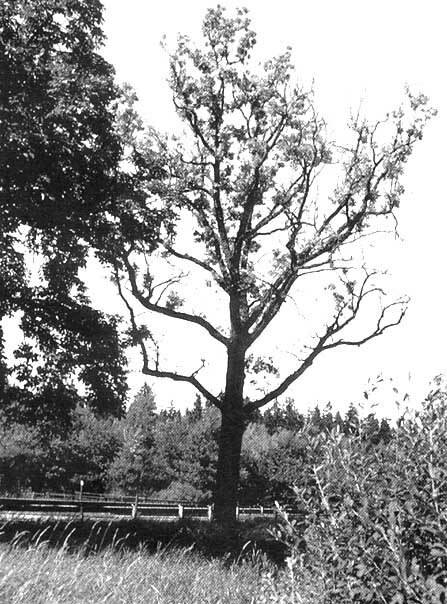 Defoliation and other alleged symptoms of Waldsterben were not quantified or recorded in forest inventories before 1983. However, there have been some estimates of the extent of crown thinning in earlier summer drought periods, similar to those occurring in the mid-1970s and early 1980s. For instance, Rebel (1924), who observed an increase in poor crown conditions in Bavaria in the early 1920s, called this phenomenon "heat disease" and suggested that 21 to 51 percent of the forest area in the various regions of Bavaria were "endangered or irreversibly diseased", i.e. they showed defoliation equivalent to the present damage classes 1 to 3. Thus, Rebel's estimate of forest damage in Bavaria lies in the same range as that of the current forest damage reports. Many other reports on regional and local diebacks of unknown causes, often comprising all tree species and thus resembling the present description of Waldsterben, are found in historical forest literature (cf. Kandler, 1992a). A comparison of recent photographs documenting Waldsterben (e.g. Schütt, 1984; Bauer, 1985) with old photographs of forest stands in scientific journals, photograph albums and postcards, shows that trees with transparent crowns were also common in former times. An evaluation of about 2 000 clearly recognizable spruce trees on postcards from before 1925 and from 1975 to 1985 (Schweingruber, 1989) has shown that 16 to 41 percent and 16 to 21 percent of the trees exhibited distinct foliage deficits equivalent to classes 2 and 3 in the first and second period, respectively. These numbers are virtually identical to those of the recent Swiss surveys (WSL, 1992). A comparison of old and recent photographs of the same stands also visualizes the small-scale mosaicism of crown conditions and their non-synchronous dynamics within stands (Fig. 8). 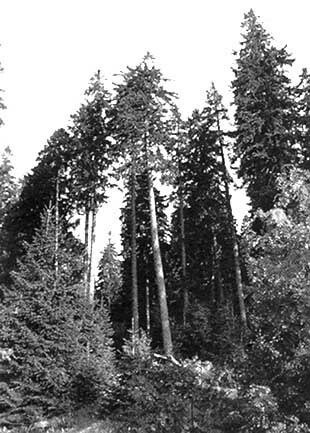 Each of four heavily damaged spruce trees photographed in 1959 in the Bavarian Forest behaved differently during the following 27 years. In 1959 tree I would have been in damage class 1 or 2, and trees 2 to 4 would have been in class 3. By 1986 the condition of tree 1 had worsened but tree 2 had improved slightly while trees 3 and 4 had regenerated almost normal upper crowns. Air pollution, soil acidity or climatic conditions, the alleged causes of the annually recorded novel forest damage are unlikely causes for the different fates of these neighbouring trees. More probably, root and heart rot, found by core inspection, became more or less acute or were fully suppressed by the oscillating tree pathogen interaction (cf. Shigo, 1985). 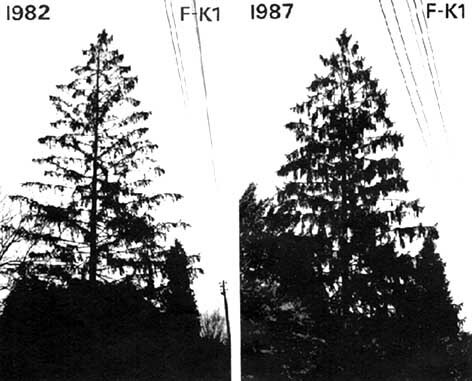 A second example shows the recovery of a severely defoliated (damage class 3) spruce tree (F-K1) within a few years (Fig. 9). Compared with the two healthy trees (F-K2 and F-K3) growing only 10 to 20 m away, the annual growth increment for F-K1 (Fig. 10) started to decrease in 1969 and was minimal in the dry summer of 1976 when needle loss began. Recovery of incremental growth began in 1980 but needle loss was greatest in 1982. In the following years the infections were at least partly overcome, more needles were produced than were shed and, in 1987, the tree returned to class 1. When the tree was cut, Heterobasidion annosum (Fr.) Bref. and Armillaria mellea sensu lato were found to have affected the tree. About one-fourth of the cambium at the base of the bole was killed in 1978. The many new roots that had formed since 1980 led to recovery of the crown. Oscillations of crown conditions in much shorter periods than those caused by root and stem diseases are mostly due to climate conditions and/or infections and infestations of the foliage by pathogens or insects. The annual fluctuations of crown conditions seen in annual surveys have been studied best in Switzerland. Here, the degree of foliage deficit in about 7 500 marked trees included in the annual surveys (WSL, 1989) were judged in stepped 5 percent damage classes and the annual changes of >10 percent have been depicted in a diagram (Fig. 11). The increase in improvements in the higher damage classes corroborates the earlier statement that the series of annual surveys does not indicate a shift from the lower to the higher damage classes with time, as proposed by the Waldsterben concept, but rather a dynamic steady state of crown conditions at a slightly fluctuating level. · retrospective studies on forest conditions suggest that similar levels of crown transparency were found in Norway spruce at the beginning of this century as are today and that recurrent decline episodes take place in the main tree species. Thus, the results of a decade of research are not compatible with the central dogma of the Waldsterben concept. They rather confirm the occurrence of non-synchronous fluctuations of forest conditions and recurrent episodes of clarified as well as unsettled species specific declines. Waldsterben may be understood as a problem of awareness: forest conditions that were believed to be "normal" in earlier times suddenly became a symbol of the growing fear of the destructive potential of human activities on the environment. However, holistic concepts such as the Waldsterben hypothesis are of little help in solving problems. Rather they raise emotions and lead to premature conclusions. To gain a real understanding of the multitude of decline phenomena in our forests, we must continue to analyse symptom by symptom, species by species and site by site, according to the classical principles of phytopathology and forest science in general. Figure 11. Percentage of about 7 000 trees from Swiss annual forest surveys in: 5% foliage deficit classes remaining unchanged; improved >10%; or deteriorated >10% during the period 1987-1989. The relationship of foliage deficit to German damage classes is also provided. Anon. 1991. Waldzustandsbericht. Munich, Bayerisches Staatsministerium für Ernährung, Landwirtschaft und Forsten. Bauer, F. 1985. Die Sache mit dem Wald. Munich-Vienna-Zurich, BLV Verlagsgesellschaft. BELF. 1992. Waldzustandsbericht der Bundesregierung - Ergebnisse der Waldschadenserhebung 1992. Bonn, Bundesministerium für Ernährung, Landwirtschaft und Forsten. Binns, W.O. & Redfern, D.B. 1982. Acid rain and forest decline in West Germany. Forestry Commission Research and Development Paper 131. Farnham, Hants, UK, Forestry Commission. Brasier, C.M. 1992. Oak tree mortality in Iberia. Nature, 360(6404): 539. Braun, H.J. 1981. Zur Erkrankung der Fichten im Forstamt Sauerlach. Allg. Forstzeitschr., 36:661. Brucknann, P.& Pfeffer, H.U. 1992. Langjährige Entwicklung der Luftqualität in urbanen Gebieten am Beispiel des Ballungsraumes Rhein-Ruhr. VDI Ber. 952: 152-166. Der Spiegel. 1981. Säureregen: "Da liegt was in der Luft". Der Spiegel, (47): 96-110; (48): 188-200; (49): 174-188. Häsler, R. 1991. Photosynthese und stomatäre Leitfähigkeit der Fichte unter dem Einfluss von Witterung und Luftschadstoffen. In M. Stark, ed. Luftschadstoffe und Wald, p. 143168. Zurich, Verlag der Fachvereine ETH. Hofmann, G., Heinsdorf, D. & Krauss, H.H. 1990. Zunehmende Stickstoffeinträge in Kiefernbeständen als Schadfaktor. Forstwirtschaft Berl., 40: 40-44. Kandler, O. 1988a. Epidemiologische Bewertung der Waldschadenserhebungen 1983 bis 1987 in der Bundesrepublik Deutschland. Allg. Forst-Jagdztg., 159: 179-194. Kandler, O. 1988b. Lichen and conifer recolonization in Munich's cleaner air. In P. Mathy, ed. Air pollution and ecosystems, p.784-790. Proc. of an int. symp., Grenoble, France, 18-22 May 1987. Boston, MA, USA, D. Reidel. Kandler, O. 1990. Epidemiological evaluation of the development of Waldsterben in Germany. Plant Dis., 74: 1-12. Kandler, O. 1992a. Historical declines and diebacks of central European forests and present conditions. J. Environ. Toxicol. Chem., 11: 1077-1093. Kandler, O. 1992b. The German forest decline situation: a complex disease or a complex of diseases. In P.S. Manion & D. Lachance, eds. Forest decline concepts, p. 59-84. St Paul, MN, USA, APS Press. Keller, W. 1992. Bonität in Fichten-Folgebeständen ehemaliger Fichten-Versuchsflächen der WSL. In Deutscher Verband Forstlicher Forschungsanstalten Freiburg. Bericht der Jahrestagung vom 1-3.6.1992 der Sektion Ertragskunde. Koch, W. & Lautenschläger, K. 1989. Vergleichende Gaswechselmessungen unter Reinluft und Standortsluft an Fichte zur quantitativen Ermittlung von Primärschäden durch gasförmige Luftverunreinigungen. In J.B. Bucher & I. Bucher-Wallin, eds. Air Pollution and Forest Decline. Proc. Int. Meeting IUFRO Proj. Group P2.05 14th, p. 119-124. Birmensdorf, Switzerland, EAFV. Kreutzer, K. & Göttlein, A., eds. 1991. Ökosystemforschung Höglwald. Hamburg-Berlin, Paul Parey. 261 pp. Liebold, E. 1988. Wirkungsmodell der längerfristigen Schadensprognose im SO2 geschädigten Fichtenwald. Wiss. Z. Tech. Univ. Dres., 37: 243-247. Manion, P.D. 1987. Decline as a phenomenon in forests: pathological and ecological considerations. In T.C. Hutchinson & K.M. Meema, eds. Effects of atmospheric pollutants on forests, wetlands and agricultural ecosystems, p. 267-275. Berlin, Springer-Verlag. Meister, G., Schütze, C. & Sperber, G. 1984. Die Lage des Waldes. Ein Atlas der Bundesrepublik. Daten, Analysen, Konsequenzen. Hamburg, GEO im Verlag Gruner & Jahr. 352 pp. Neüland, H., Bömelberg, J. & Jenhagen, P. 1990. Regionalstatistische Analyse des Zusammenhanas zwischen Standort be clingungen und waldschäden. Jülich, Germany, BEO-Forschungszentrum. Neumann, M. & Pollanschütz, J. 1991. Waldzustandsinventur 1991 - Keine entscheidenden Veränderungen. Österr. Forstzeitung, 102: 23-24. Nihlgard, B. 1985. The ammonium hypothesis -an additional explanation to the forest dieback in Europe. Ambio, 14: 2-8. Pfleiderer, E.-H. 1984. Waldsterben aus der Sicht des Holzmarktes und der Holzwirtschaft. Allg. Forstzeitschr., 39: 1160-1161. Rebel, K. 1920. Streunutzang, insbesondere im bayerischen Staatswald, Diessen vor Munchen. Munich, Jos. E. Huber. Rebel, K. 1924. Waldbauliches aus Bayern. II. Band. Diessen vor München. Munich, Hubers Verlag. 228 pp. Schneider, T.W., Lorenz, M. & Poker, J. 1987. Abschätzung der erträglichen Folgen der neuartigen Waldschäden im Bereich der Landesforstverwaltung Hamburg mit Hilfe dynamischer Wachstumsmodelle. Mitt. Bundesforschungsanstalt. Forst Holz-wirtsch., 155: 61-77. Schütt, P. 1980. Das Tannensterben - ein Umweltproblem? Holz-Zentralblatt, (106): 545-546. Schütt, P. 1981. Folgt dem Tannensterben ein Fichtensterben? Holz-Zentralblatt, 11: 159160. Schütt, P.1982. Aktuelle Schäden am Wald - Versuch einer Bestandaufnahme. Holz-Zentralblatt, 25: 369-372. Schütt, P. 1984. Der Wald stirbt an Stress. Munich, Bertelsmann Verlag GmbH. Schweingruber, F.H. 1989. Bäume schweizerischer Gebirgswälder auf alten und neuen Postkarten. Allg. Forstzeitschr., 44: 262-268. Shigo, A.I. 1985. Compartmentalization of decay in trees. Sci. Am., 252: 76-83. Spelsberg, G. 1992. Zuwachsmessungen in den Stichprobenbeständen der Waldschadenserhebung in Nordrhein-Westfalen. Recklingheusen, Bericht der Landesontstalt fur Ökologïe, Landschaftsentwicklund und Forstplanung. UBA. 1992. Monatsberichte aus dem Messnetz. 1992. Berlin, Umweltbundesamt. Ulrich, B. 1980. Die Wälder in Mitteleuropa: Messergebnisse ihrer Umweltbelastung. Theorie einer Gefährdung, Prognose ihrer Entwicklung. Allg. Forstzeitschr., 35: 1198-1202. Ulrich, B. 1989. Effects of acidic precipitation on forest ecosystems in Europe. In D.C. Adriano & A.H. Johnson, eds. Acidic precipitation, Vol. 2, p. 189-272. Berlin, Springer-Verlag. Vincent, J.-M. 1989. Quantitative Untersuchungen am Feinwurzelsystem von Altbuchen unterschiedlicher Schadstufen. Allg. Forstzeitschr., 43: 793-794. Vincent, J.-M. 1991. Oak decline: alteration of the fine root biomass with the progress of the disease (preliminary results). In R. Siwecki & W. Liese, eds. Oak decline in Europe, p. 173-175. Körnik, Poland, Polish Academy of Sciences Institute of Dendrology. Weidenbach, P. 1992. Waldbauliche Ziele und Ergebnisse. Allg. Forstzeitschr., 13: 711-717. Wentzel, K.F. 1982. Ursachen des Waldsterbens in Mitteleuropa. Allg. Forstzeitschr., 43: 1365-1368. Wieser, G., Weih, M. & Havranek, W.M. 1991. Ozone fumigation in the sun crown of Norway spruce. GSF-Bericht 24/91. Neuherberg, Germany, GSF-Forschungszentrum für Umwelt und Gesundthëit. WSL. 1989. Sanasilva-Waldschadenbericht 1989. Birmensdorf, Eidg. Forschungsanstalt für Wald, Schnee und Landschaft. WSL. 1992. Sanasilva-Waldschadenbericht 1992. Birmensdorf, Eidg. Forschungsanstalt für Wald, Schnee und Landschaft. Zöttl, H.W. 1990. Remarks on the effects of nitrogen deposition to forest ecosystems. Plant Soil, 128(1): 83-89.